An elated and emotional Michael Keiner posed for photos after capturing his first WSOP bracelet, earning $146,987 for his win. Nesbitt Coburn was our runner-up, netting $80,876 for second. Visit www.pokernews.com for a complete wrap-up of the event. The Doc is picking apart at Nesbitt Coburn with the precision of a surgeon. Nesbitt is down to his last 80,000 chips. In the first five or ten minutes of heads-up play, Coburn showed signs of grit, quickly catching up to Keiner's lead. Since then, it's been all Michael Keiner; he just took down the biggest pot of the tournament, worth over 200k, with Broadway (an ace-high straight), against Coburn's set of sixes. Keiner is fast approaching one million in chips. After a series of raises, Nesbitt's queens are good enough to beat Keiner's tens, and Coburn inches closer to the lead. Twice since heads-up play began, Michael Keiner has made a flush on the river and checked, not realizing the strength of his hand. Nesbitt seemed to be the main voice behind the decision to continue play tonight. He even declined the opportunity to be filmed by ESPN tomorrow afternoon. The pair are separated by a little over 100,000, which isn't much considering the size of their stacks. Stay tuned; we will have a new bracelet winner tonight...err...this morning. 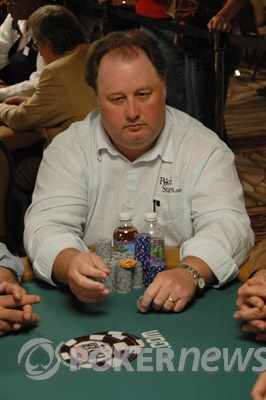 Nesbitt Coburn just eliminated Steve Sung in third place, setting the stage for a heads-up duel between Coburn and German superstar Michael Keiner. Sung received $51,222 for his top-three finish. After Sung's elimination, the tournament director informed our two finalists that ESPN would like to film a portion of their heads-up match and conduct a bracelet ceremony with commissioner Jeffrey Pollack. Coburn and Keiner took a short break to consider their options -- we'll let you know what they decide on. Showing , Steve Sung bet fourth, fifth, and sixth streets, and was called all the way down by Michael Keiner. Both players checked the river, and Keiner's tens were good enough to scoop the pot. Keiner now has more than half the chips in play. 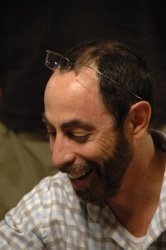 As I'm writing this post, Barry Greenstein is signing a copy of his book for Nesbitt Coburn, the man who eliminated him from the tournament. Barry's fourth-place finish landed him $33,698 -- not bad for two day's work. Underneath the event name and date, Barry includes the exact hands each player held, and signs his name at the bottom. Talk about class? Barry defines the word.